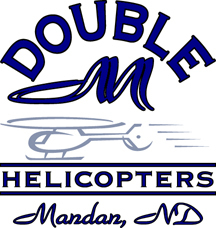 DOUBLE M HELICOPTERS IS A LOCALLY OWNED AND OPERATED FULL SERVICE HELICOPTER CHARTER BUSINESS BASED IN NORTH DAKOTA. WE ARE THE AREAS ONLY UTILITY HELICOPTER SERVICE. WE OPERATE STATE OF THE ART EQUIPMENT AND PROVIDE A UNIQUE AVIATION SERVICE TO THE BAKKEN OIL FIELD, WESTERN AND CENTRAL NORTH DAKOTA. FOR MORE INFORMATION ON CURRENT PRICING, SCHEDULING, AIRCRAFT AVAILABILITY, SPECIFIC AIRCRAFT CAPABILITY OR SPECIFIC MISSION OPERATIONAL GUIDELINES, CLICK ON OUR "CONTACT US" LINK. WE OPERATE BELL 206BIII "JETRANGER" HELICOPTERS CONFIGURED FOR ALL OUR OPERATIONS. EACH AIRCRAFT CARRIES UP TO $5,000,000 LIABILITY INSURANCE AND WE HAVE FLEXIBLE INSURANCE OPTIONS. Helicopter Hotshot Operations to the Bakken Oilfield, Aerial Survey, Raptor Surveys, Animal Herding,Powerline and Pipeline Patrol, Charter, High Definition Photography, Concession Rides.